You know how important it is for children to learn and memorize Scripture. But it's not easy to teach kids the joy of learning Scripture by heart. Children's Worship Bulletins are carefully designed by using proven educational methods to make it easy to teach children about the Bible. In each bulletin, you'll find engaging games, word puzzles, dot-to-dots, mazes and many other activities to help you show your children the joy of learning Scripture. Let us show you how easy it is to use our bulletins to create Sunday school activities about Lazarus. In this short article, we'll share two activities — one for each age group — for you to use in your next Sunday school class. Try one or both! 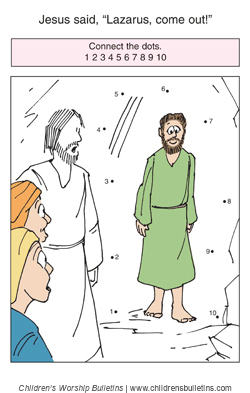 Sunday school activity about Lazarus for ages 3-6: Jesus said, "Lazarus, come out!" Give each child a bulletin and some crayons. Read John 11:1-45 while the children complete and color the puzzle. When finished, engage the children in a conversation about miracles. Ask them if they can think of other examples of miracles to gauge their understanding of their significance. 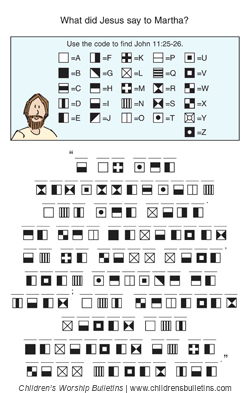 Sunday school activity about Lazarus for ages 7-12: What did Jesus say to Martha? Give each child a bulletin, pencil and scissors. Explain the activity, "In today's story, we're going to hear a very important truth about Jesus — so important, in fact, that we're going to memorize it. First, complete the puzzle 'What did Jesus say to Martha?' Then, I'll show you how easy it is to memorize this verse." Allow the children to complete the puzzle. When they have all completed it, give them the copy of John 11:25-26, and have them cut out each word. Have them cut out the reference in one piece. Explain, "We're going to memorize the 28 words and one reference of this verse. First, with all the words right-side up, scramble them in front of you. When I yell, 'GO!' see how quickly you can put the words in order. Raise your hand when you're done." Yell, "GO!" and wait for the first child to finish. Have him or her read the verse and reference as they've unscrambled it. Next, explain another memorization technique. "Now, turn each word and the reference over, and scramble them again. When I yell, 'GO!' turn over one word at a time, putting each in order before turning over another word. See how quickly you can put the words in order. Raise your hand when you're done." Finally, explain the last memorization technique. "This time, leave your verse and reference as it is, in order in front of you. Read the verse to yourself, concentrating on each word as your eyes move from word to word. Then, turn over a word. Reread the verse to yourself, making sure you remember the word on the piece of paper that you've turned over. Continue rereading the verse and turning over one word at a time until you've turned over every word. When you've turned over every word and can recite the entire verse and reference, raise your hand." Then say, "Ready? GO!" Wait for the first child to finish. Have him or her recite the verse and reference as they've memorized it. Explain, "Now you can use these three methods to help you memorize any verse — no matter how long. Simply write each word of the verse on a separate piece of paper (you can cut them out like we did, or write each on an index card). And just like we did today, first, scramble the words and put them in order. Next, turn them over, scramble them and put them in order, one at a time. Finally, reread the verse, each time turning over one word until all of the words are turned over. You will be amazed at how quickly you can memorize Scripture!" 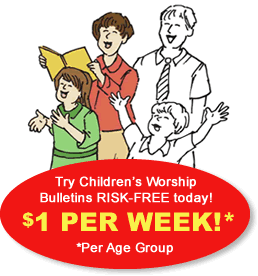 Sign up for a subscription to Children's Worship Bulletins, and see how easy it is to create flexible, meaningful Sunday school activities. You can download as many bulletins as you choose from our extensive library, or you can choose for us to deliver bulletins to you each week by email. Customize each with your church name, contact information and logo. We've designed our bulletins with four full panels so that they fit on both sides of standard 8-1/2" x 11" paper, making them easy to duplicate.